Therese May has been a leader in the creation and development of art quilting, recognized worldwide as a guiding light in the movement and one of its most inspiring advocates. Honored as both artist and teacher, she has been chosen to exhibit her works at the Smithsonian Institution in Washington and at the Louvre in Paris, France. Among Therese’s many awards are the Most Innovative Use of Medium award in Quilt National ’85 and the Quilts Japan Prize in Quilt National ’95. Her work is published in numerous books and magazines, including The Art Quilt and America’s Glorious Quilts. Her 1969 quilt Therese was selected by The Alliance for American Quilts, the American Quilt Study Group, the International Quilt Association, and the National Quilting Association as one of the 100 best American quilts of the 20th century. Therese began making quilts in 1965 and has exhibited throughout the United States, Europe and Japan. With a focus on transformational healing, her work is centered on wholeness, integration and creativity through art and the quilt-making process. To realize and continue this focus, she makes herself available as a teacher, leading workshops for groups as well as providing individualized one-on-one sessions. She has appeared on the television show Simply Quilts and has taught at Arrowmont School of Arts and Crafts; the Cleveland Institute of Art; Cabrillo College; the University of California, Santa Cruz, Department of Art and Design; and the University of Minnesota Split Rock Arts Program, as well as in many quilt guilds. In addition to Therese May’s other awards and recognitions, she was commissioned twice, in 1991 and 1992, to create quilts for the City of San Jose, California, and her two 196-square-foot works hang in the San Jose Convention Center. Her art quilts hang in many hospitals in Northern California and are included in numerous private collections. Therese has been part of the San Jose art community for the past 43 years and has participated in all of the Silicon Valley Open Studios. 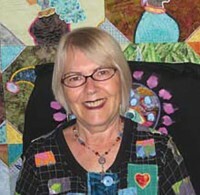 She holds a bachelor of arts degree in painting and a master of arts degree in design, with emphasis on the art quilt. It was wonderful and unexpected! And it was very validating and allowed me to be more aware of my own value as an artist in the community. When meeting other artists, I saw how meaningful we are as a group. Listen to your heart to find out what is really the authentic art for you to be doing and then never give up on yourself. dynamic, inspiring, available to all.